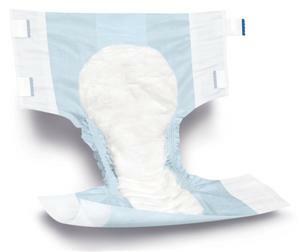 ULTRACARE brief for heavy absorbency. Size Extra Large, (59-66 inches), 20/bag, 60/case. Triple absorbent core offers several benefits including: treated fibers which neutralize pH of urine, dry acquisition lining which prevents moisture from resurfacing, and a high performance core which keeps moisture away from the skin. Packaging is in clear bag.